‘I hope that we can use the common yearning for social justice as an avenue to engage youth and I hope that we can create new spaces for community within the Church,’ Ms Green added. 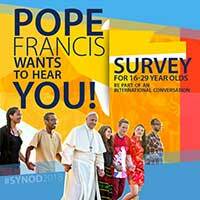 Pope Francis has called young people to join this inclusive journey saying that the Church ‘wishes to listen to your voice, your sensitivities and your faith; even your doubts and your criticism. Make your voice heard, let it resonate in communities’. He stressed, ‘Every young person has something to say to others…all of us need to listen to you!’, and he added ‘even young people who consider themselves agnostics, even young people whose faith is lukewarm; even young people who no longer go to Church; even young people who consider themselves atheists’. Developed by the Pastoral Research Office in collaboration with the ACU Ethics Committee, the survey can be completed online https://www.catholic.org.au/youthsurvey. It will run for four weeks, the closing date for responses is midnight on Sunday, 2 July 2017.